The Congressional Gold Medal was awarded to a local veteran of World War II. Years ago when I worked in house at a health system as a public affairs staff associate in one of my first jobs, I remember spending the whole day at the hospital with a television news camera crew. They wanted all kinds of “medical” visuals. Doctor and patient interactions. Laboratories including vials of blood. Nurses checking their charts. When I saw the story later that evening on the news, the health system wasn’t even mentioned. We weren’t part of the voice over and none of the footage was attributed to the health system. I was too junior to be fuming but I knew something wasn’t right. The producer just needed fresh b-roll for a story on health trends and she didn’t care how or where she acquired it. While we may have perpetuated a reputation for being friendly and accommodating with that network, all that time spent with the crew and away from my desk did nothing for the health system’s brand. We weren’t part of the story and we really didn’t even know how to make sure we were part of it. It’s very easy to be cut or not included in broadcast media coverage, especially television news stories, which are short and less in depth than print stories. You have to fight this deliberately because, in our experience at SPRYTE, it happens fairly often. That was the case recently with a very special event SPRYTE was called on to publicize for a local health system client on very short notice. 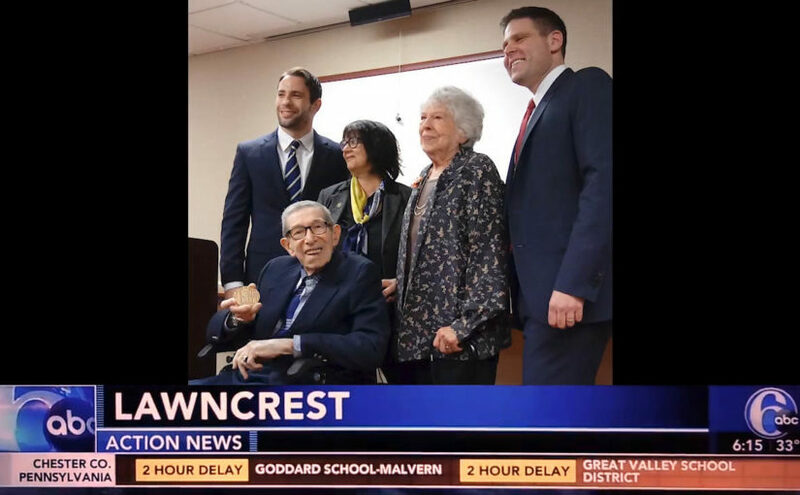 Max Gordon, age 94 of Northeast Philadelphia, was to be presented with the Congressional Gold Medal for his service in the Office of Strategic Services during WWII. The ceremony was attended by State Representative Jared Solomon, an aide to Congressman Brendan Boyle and an aide to Pennsylvania Senator Pat Toomey. It took place at the long-term care facility where Gordon had recuperated after suffering a heart attack. Once discharged and back home, Gordon received in home care from a physical therapist from our health system client. So, you can see there were a lot of personalities and a minimum of three institutions involved. SPRYTE rushed to interview Gordon’s wife Hilda to learn more about his military service and his long life and to prepare the Media Advisory. The next day the Congressional Gold Medal ceremony took place. The good news is that three television networks covered the ceremony and multiple broadcast stories ran. There was also a feature story with photos in the Northeast Times, a local newsweekly. The media coverage shone a humble spotlight on a wonderful man’s service to our country decades ago. The bad news is that, on their behalf, we did all the work to earn media coverage but our client wasn’t mentioned in any of the coverage. The value of the earned media placements was significant but not for our brand. So how do you make sure your client or organization is part of the coverage? One word: The visual. Sometimes the only way in to the story is with the visual. It can feel bold, but earned media pros must fall on our swords about visuals or, what transpired after Gordon’s ceremony is very likely. So in retrospect, how could we have made sure our client was part of the Congressional Gold Medal ceremony story? How about with a big banner congratulating Gordon, produced with our client’s logo and brand colors? This simple prop would have made all that coverage ours. Nonprofits tend to be very generous and it may not have even been noticed by our client that they weren’t part of all of Gordon’s media coverage. But as experts who garner earned media on a daily basis for our clients, we do everything possible to make sure media coverage delivers brand visibility for our clients and that means they must be part of the story, especially if they’re funding the outreach. » Next post: How Are You Celebrating Volunteer Week?